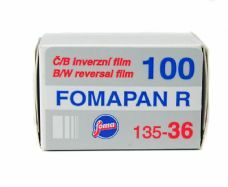 Fomapan R is a 100ASA reversal film for making black & white slides. It is coated onto a clear acetate base and is available in a range of motion picture formats aswell as 35mm 36 exposure stills format. Requires the Foma B&W reversal processing kit to develop. Please note, we do NOT process this or any other reversal b/w films as a lab service.